Cordyceps militaris is an ascomycete fungus that parasites on butterfly pupae. The most common are hawk moths. These pupae are hidden in soil, decaying wood or moss. Cordyceps militaris mainly grows in deciduous and mixed forests, less often outside the forest, in places where the host insects occur. We can find it in both lowlands and uplands, from June to December. The fungus isn’t edible. The fruiting body grows from the soil, from the host pupa, and its height above-ground is only 20 to 60 mm. The fruiting body has an irregular clubbed or cylindrical shape, is flat and rough. It has a dark orange to red colour. The stem is cylindrical, glabrous and lighter in colour than the fruiting body, and is in the soil as deep as the host’s larva/pupa. 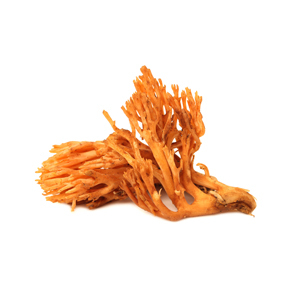 Although the fungus isn’t edible, it’s highly sought after because, like Cordyceps sinensis, it’s used in traditional medicine to treat many diseases. But it’s also studied by modern science to demonstrate its effects through experiments and clinical trials.